Norwegian bassist Mats Eilertsen has been a distinctive presence on ECM recordings by, amongst others, Tord Gustavsen, Trygve Seim, Mathias Eick, Nils Økland, Wolfert Brederode and Jakob Young and has long maintained several projects of his own, including this trio, now in its 10th year of existence. 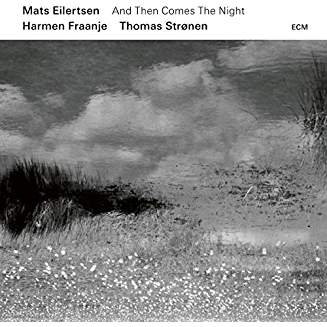 And Then Comes The Night (named after the novel by Icelandic writer Jón Kalman Stefánsson), was recorded at Lugano’s Audiotorio Stelio Molo and Eilertsen, drummer Thomas Strønen, and Dutch pianist Harmen Fraanje make full use of what Mats calls the studio’s “special character and atmosphere” and the acutely-focused interplay the room encourages. “We came in with a number of compositional sketches and the intention of seeing what could be shaped from them, with Manfred Eicher’s help, in that specific space.“ The result is an album of subtle group music, sidestepping many of the conventions of trio playing, in a recording that demands and rewards concentrated listening.